This large JRB tarp is the most capable tarp available for either hammock or ground camps. Loaded with perimeter tabs, ridge line tabs, panel pulls, pole grommets and spring pole guides this tarp may be configured to conform to a nearly any configuration required or desired. It’s an ideal shelter for large and wide hammocks like bridge style hammocks. It can be pitched in a classic A with open ends, or closed ends for storm protection. Interior volume is easily expanded by use of panel pull tie-outs; alternatively, interior volume can be increased by the addition of JRB Spring Poles (separately available) to create either single hoop or a tunnel style shelter. Gathered end hammocks users can arc the center area with a single spring pole. Bridge style hammock users can use two spring pole to create the tunnel style sought by many. In either case the ends may be closed or nearly closed for storm protection. Open pitches like the Baker style lean to or the three sided Adirondack shelter are also possible. In classic “A” Pitch it can easily accommodate 3-4 ground dwellers with generous overhang. It can be pitched high and wide for maximum overhead shelter providing almost 120 square feet of overhead cover if needed. This will accommodate multiple hammocks in close proximity or quick easy coverage over a picnic table for a lunch reprieve during inclement weather. 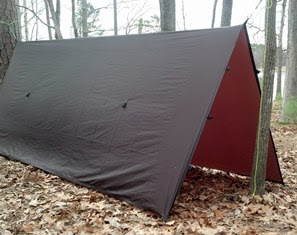 The JRB 12’x10′ Universal Tarp has a true 12 foot ridgeline and a width of 9 feet 8 inches. It weighs only 21 ounces in a 1.1 oz. silicon impregnated nylon woodland camouflage pattern or 24 ounces in a dark brown silicon impregnated nylon with a urethane coating for security in severe storm plagued locations.